Atlanta opera inspires visually impaired kids to "do anything"
ATLANTA, Georgia (CNN) -- As little Tatyana Larbi, aka Little Miss Muffett, sings about selling her cotton and twigs to the "sister pigs," you can tell the young girl is enjoying her moment in the limelight, even if she can't see the audience's response. 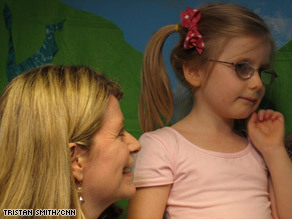 The mother of Brooke Stegall, 5, says opera gave her visually impaired child new confidence. The set and costumes are pretty basic. Most were made by parents and volunteers. But that doesn't matter to the beaming mothers, fathers and grandparents in the audience. The fact that these 10 children are performing this day is enough for them. All of the actors in the Pumpkin Pickle Pop Cookies Opera are visually impaired 4- and 5-year-olds. Two are blind, and the others have varying degrees of sight. All are students in Atlanta's Center for the Visually Impaired BEGIN program. "These parents work so hard to make this happen," said Anne McComiskey, director of the program. She is very aware of the efforts that both the children and the parents put into the program. "They have to give up vacation time from their jobs," she said. "Some people travel two and three hours once a week to get here." McComiskey says the program works with newborns, sometimes only days old, up to 5-year-olds. It helps parents understand what is possible for their visually impaired or blind children. "First of all, we are teaching the parents how to teach their child," she said. "Because some 90-odd percent of learning comes through your vision, we have to teach mommy and daddy how to do what they would do typically, a little differently." She says with the infants, it can be even more basic. "With a newborn, you're teaching them about their body. A lot of kids don't know they have feet. They have never seen them." All of the children go to the center one day a week. The BEGIN program, which is an acronym for Babies Early Growth Intervention Network, was started in 1985 and has about 95 children go through the program each year. The course costs $250 to register, but financial assistance is available. McComiskey says the performance reinforces lessons learned during the course of the program. "Because this is an opera, they are learning gestures that they wouldn't learn by watching someone else. And they are learning how to listen and respond. They are learning to work in a group. It's just many of the concepts that we have been teaching them for five years, coming to play in the opera." Jacqueline Howard is the center's music therapist. She came up with the idea for the opera while talking with some of the teachers. She also sees lessons in the performance. "If you have a visual challenge, you want to be safe in the space you're in, because you may not be able to see everything around you. So the movements help them feel safe in the space, and we learned to move, sing and play instruments at the same time, which is a challenge for anyone!" Brooke Stegall, 5, played one of the five "sister pigs" in this opera loosely based on "The Three Little Pigs," which added the twist of a few other nursery tale characters. Her mother, Rhonda, says the opera changed her daughter. "She is just a naturally reserved child, and to see her go up there and just sing and do the motions and just smile and have fun -- it was just great." McComiskey says that that is one of the goals of the program: to instill a sense of "I can" in the kids. In this case, all 10 students seem to have taken that lesson to heart. All of them will be attending mainstream kindergartens in their school districts next fall. "That is most unusual, for a child that is blind or visually impaired to go right into a typical kindergarten," McComiskey said. McComiskey and the program's teachers worked hard to make sure they are more than prepared. "We want our kids going into kindergarten ahead of the sighted children in literacy. So we want Tatyana reading Braille, and we want them to be using the long cane so that they can go to the office or whatever, just like anyone else can." Adds Jacqueline Howard, "I always say success breeds success, and the confidence they felt by completing this task, when they're asked to do other things, they'll remember, 'I did that. I can do anything.' "
Tatyana enthusiastically agrees after the performance. "I am so proud of myself."